184 pages | 20 B/W Illus. This book explores the social implications and challenges of low-carbon development. The argument of the book is that a broad understanding of low-carbon development is essential for mitigating climate change and enabling development in a carbon-constrained world, but there are risks that low-carbon development might come at a price that is both social and economic. These risks need to be carefully assessed and reduced. 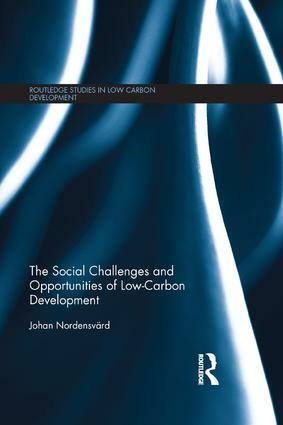 The main aim of the book is to explore, critically analyse and propose different ways of understanding low-carbon development from a social perspective in both developed and developing countries. The author uses concepts such as low-carbon development, social policy, sustainable development and environmental justice to understand the social implications of low-carbon development projects. solar power for refugees in Africa. The book fills a crucial gap for researchers, postgraduates, practitioners and policy-makers in the fields of climate change, development and social policy. Johan Nordensvärd is a Lecturer in Social Policy at the University of Southampton, UK.